The time of reaping is at hand. There is a feeling of completion infused into the atmosphere during this Moon Phase. The opportunity opens to recognize how far you’ve come in various parts of your life. This is not a good time for new beginnings, but rather a reflective period suited to evaluating how you have been using your time and what has been accomplished. Issues of authority may arise. 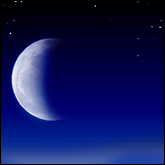 This Moon Phase supports taking responsibility for actively "tying up the loose ends" of projects that are already underway.